Each of these zones is split into twelve longitudinal slices. On Monday through Saturday, two slices a day will be discussed at length. 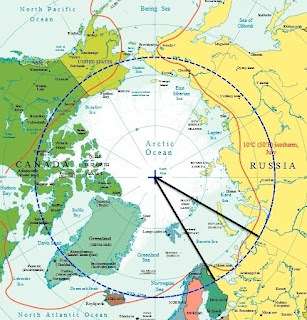 This is more than double the readings of any other region, though many other regions have a lot more land mass above the Arctic Circle, a huge amount of the data is from northern Scandanavia, but the Norwegians also have a lot of stations on Svalbard Island, the island in blue in the middle of the slice. The northernmost islands are Franz-Josef-Land. This map has them in blue and says Norway has jurisdiction, but other sources say the islands belong to Russia. As we travel east across Russia, the number of readings decrease. Very little land, very few readings. The amount of land is not that much more than Region 6, but the number of readings goes way up. The Alaskans are doing more work than the Siberians would be the obvious inference. Before this post becomes too jingoistic, it looks like the northern Canadians are more interested in climate data than the Alaskans. While nowhere near the most land mass of the Western hemisphere slices, by far the most readings. A lot more land mass than Region 8, somewhat less than Region 10, but less readings than either. The second most readings of the Western Hemisphere and a large clump of land near the pole. The slice with far and away the most polar land mass, the number of readings in the all Greenland slice does not speak well of Danish in comparison to the work done by the Canadians right next door. A much smaller land mass than region 12, but more than region 6, the only region with less readings. C'mon, Denmark! Time to show a little pride about what's happening on that big chunk of polar real estate you own! Enough with the nation chiding and praise. Tomorrow we start looking at what's going on in these slices of the Arctic over the time period defined by Strong Oceanic Niña Interval years 1955 and 2010.